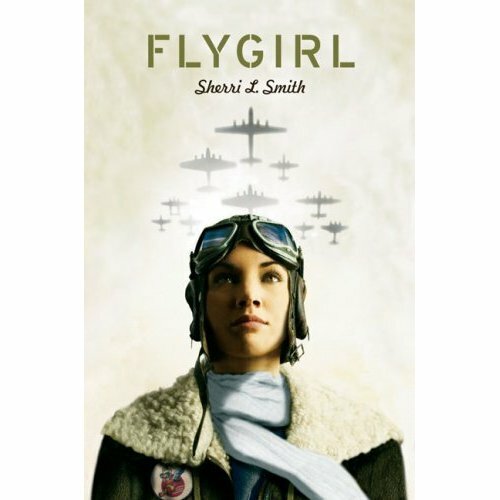 Flygirl by Sherri L. Smith. Speak, 2008. Currently available. Face Value: I find this cover captivating. Seeing a young woman of color in pilot’s garb immediately catches the eye, and it looks contemporary and historical at the same time. There is a sense of boldness in her gaze that really draws me in. Ida Mae often has to stand strong on her own, and the focus on her in the cover shows just how independent and steadfast she can be. Does it break the slate? It absolutely does. Ida Mae not only challenges gender norms not only within her community by choosing to leave home and pursue her dreams, and then she goes on to defy the expectations of the men in charge in the U.S. military. Ida Mae shows extraordinary personal strength throughout her journey. She is a Slatebreaking woman in the historical context of the story, but her outstanding qualities make her a model of exemplary womanhood for readers today, too. Ida Mae’s persistence taught me a thing or two while I was reading. Who would we give it to? Readers who love historical fiction, especially from the WWII era. This book is not only excellent historical fiction, it is also a complex study of race, culture, and family. It would be a great book to share with any young adult reader who is grappling with issues in any of those areas. Review: This book is the book I have been longing for. I love historical fiction, and Flygirl combined all of the elements that I love about the genre with a complex narrative of gender and race in the 1940s. Throw in a heroine who is as tough as nails and you have a novel that gripped me from start to finish. Ida Mae is a young black woman from Louisiana. When we meet her, she’s working hard to accumulate enough money to head to Chicago and enter flight school. Ida Mae grew up on a farm and learned to fly from with her daddy, who had his own airplane and brought in a little extra income from crop dusting. After a tragic farm accident claims her daddy’s life, Ida Mae decides that she needs to get her pilot license so that she can reclaim the joy of flying and bring in some money to help her family. Ida Mae is no slouch when she’s in the cockpit – she is a skilled pilot. So when she goes to take her pilot’s license test, her major concern is that she won’t get her license because she is a person of color. After an excellent flight, the inspector tells her she’s a great pilot, but he can’t give her a license because she’s a woman. Ida Mae walks away from the airfield steaming with anger because she never thought it would be her gender that would get in her way. She decides to save up for flight school in Chicago, where a woman of color can get her pilot’s license without running into so many obstacles. Before Ida Mae can make it to Chicago, war breaks out. Her older brother Thomas enlists and Ida Mae is stuck on the home front, feeling paralyzed because she cannot do anything to help Thomas or the other men fighting overseas. Then Ida Mae learns about the Women Airforce Service Pilots. They are the female pilots who ferry planes from base to base, test machinery, and fill the gaps that have been left in the Airforce while many of its men are away at war. Ida Mae longs to join. But in order to become a WASP, she suspects she will have to “pass” as white. Ida Mae’s very light skin makes this a possibility – but it’s a possibility that is fraught with ethical issues, dangerous consequences, and potential family abandonment. Eventually Ida Mae decides that she has to give it a try. She is accepted into the WASP, and begins her training at a military airfield in Texas. Although there are many scenes showcasing military procedure and the technical aspects of flying, Smith balances these moments with highly emotional scenarios. The most heart-wrenching scene in the book comes when Ida Mae’s mother travels to the base to visit her and tell her that her brother is missing in action. Ida Mae is able to speak to her mother, but in order to keep up her guise as a white woman so as not to be kicked out of the WASP, she has to pretend that her mother is her housekeeper. The conversation between them is filled with their longing to acknowledge each other as mother and daughter, but because it is a supervised encounter at a military base, they have to adopt social roles that make both of them feel supremely uncomfortable. It is this moment that almost breaks Ida Mae. She is so upset that she has humiliated her mother by treating her as if she were her housekeeper. She almost decides to announce her true identity and leave the WASP – but she realizes that she has to stay in order to use her military connections to try to locate her missing brother. I was amazed by Ida Mae’s enduring strength throughout the ordeal of waiting for news about her brother. Although Ida Mae had friends among her WASP comrades, no one cold know the true details of her family life, so she had to keep much of this emotional turmoil to herself. I was so impressed by Ida Mae’s ability to cope with family trauma and still be a stellar pilot. Instead of letting her issues detract from her concentration, she redirected that energy and focused on acing every element of her training. This was just so Slatebreaking. Despite her hidden identity, and despite the constant criticism she endured from male military counterparts simply because she was a woman, Ida Mae consistently showed that she could not only survive, but also thrive. Smith’s storytelling is very detail-oriented. She indulges my inner history-nerd with tons of amazing details about period accurate cosmetics, clothing, cleaning products, food, machinery, and more. The details aren’t gratuitous – rather, they become important elements of Ida Mae’s survival throughout her WASP training. Smith describes the turbans that the female pilots-in-training had to wear so that their hair didn’t get caught in the airplane machinery and rip out their scalps (!). Although most of the WASP disdain the turbans, Ida Mae sees them as a blessing in disguise. They cover up her hair when it gets wet and textured, which she fears might betray her racial identity. Ida Mae’s struggle with racism was so complex that I cannot begin to effectively capture it in this review. I am a white woman with white privilege and I know that reading a book that tackles racism does not automatically help me better understand racial politics. Nevertheless, I admire Smith’s approach to Ida Mae’s identity crisis. Nothing about Ida Mae’s situation was clear-cut. All of her decisions had unpredictable reverberations that rippled far beyond Ida Mae’s own consciousness. And at the end of the book, it wasn’t an easily solved situation. Ida Mae was still caught in limbo – living as a white woman, but still trying to stay connected to her black family. I would have been an unsatisfied reader if Ida Mae’s identity crisis had been easily resolved and wrapped up with a bow at the end of the book. Thank goodness for writers like Smith who leave readers with something to chew on at the end of a story. No unnecessary epilogues here – just a passage that will leave you pondering Ida Mae’s future and the many difficult choices she must make. Reviewed from a copy that Sarah gave me for my birthday. Thanks Sarah! I loved it! This entry was posted in Reviews, Young Adult and tagged Historical Fiction, pilots, Race, U.S. Military, WASP, WWII, ya. Bookmark the permalink. I love my historical fiction, so Flygirl was right up my alley. Thanks for the find!